Consider a lucrative cleaning business opportunity. Do you want a home business that pays all your bills and provides financial security while you structure your life the way you want? It's a recession-proof home business idea that you can start on a shoestring. A cleaning service is smart, especially if you're willing to do work that other people don't want to do. You'll always have plenty of work and be as busy as a bee. Cleaning is not tedious when you're getting paid well to do it. When we relocated to be near my family, I couldn't find work in my field right away. So my partner and I started a cleaning business, "Suze & Ev's Custom Clean". We intended our cleaning business to be temporary, but we love the work and our clients. The short hours are especially beneficial when you have other things in life to do. A cleaning business keeps the cash flowing in while you spend time developing your other professional goals or keep at it as your main business. It’s a noble and steady profession that pays better than most. A cleaning business can be full time or part time. Build it up or take it slowly. There is plenty of work to keep you just as busy as you want to be. Cleaning business opportunities exist for all types- single moms, dads, college students, artists and it makes an excellent second income for a family. You will love working part time or full time and earning $20 - $50. an hour. A cleaning business can pay the rent while you structure your life the way you want. A physical workout but not too strenuous. Part time or full time -- you make your own schedule. The best part about a cleaning business is that you needn't spend a lot of money on start up costs. You can start working immediately. And you don't have to wait weeks until you get paid. Get paid on the spot for the work you do. 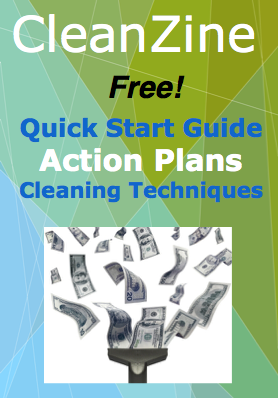 If you want to start bringing in money immediately, a cleaning service is an opportunity to do just that. Are you interested in a cleaning business, but you have no idea which type of cleaning business may be right for you? In addition to housecleaning, you may want to investigate the cleaning business opportunities in commercial, window, carpet, office, or blinds cleaning. A cleaning company will give you financial rewards and many other opportunities to enrich your life.